Cambridge Audio has gone high-def with its first Blu-ray player, the 650BD. 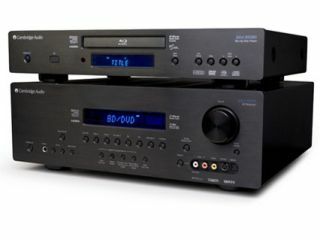 The audiophile Profile 2.0 unit features almost universal disc compatibility, handling CD, HDCD, DVD-Video, DVD-Audio, SACD and of course Blu-Ray discs. It will upscale DVDs and outputs 1080p at 50/60Hz or 24fps, along with bitstream audio, over HDMI. As you'd expect with Cambridge Audio, the sonic side of things is well catered for. Surround-sound formats include decoding of lossless Dolby True HD, Dolby Digital Plus, DTS-HD Master Audio and DTS-HD High Resolution Audio in stereo, 5.1 or 7.1 variants. Profile 2.0 means the 650BD can use BD-Live and Bonus View discs and there's 1GB of internal storage plus two USB 2.0 sockets for connecting an external drive connection for playback of high definition video, photos and music. The 650 will cost $780 in the US, with no UK pricing fixed yet. Also announced today is a matching Azur 650R home cinema receiver. This 7.1 AV amp features full HDMI 1.3c reception and processing, decodes all the latest surround sound formats and is coupled with 7 x 100 Watt audiophile grade discrete amplifier stages. A new video PCB with digital-domain video transcode means the 650R can also transcode analogue video inputs to HDMI for simplicity and flexibility, requiring just one cable to the TV screen. The 650R is also the first to feature Cambridge Audio Mic Controlled Auto Set-up (CAMCAS) with a supplied microphone for extremely quick and easy installation. And completing the perfect picture, LipSync audio delay means the user can simply adjust for processing delays in the source or TV. The Azur 650R will be available in 'late 2009' (just in time for Christmas?) for $1800 in America, with UK pricing to follow.